HPV Series Vane Type Photoelectric Sensors with Self Contained Amplifier. 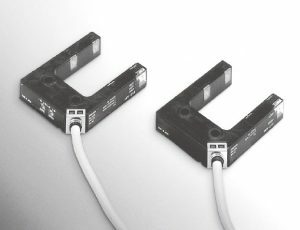 These vane type photoelectric sensors with self contained amplifiers can have up to two optical axes with each axis set individually for LO/DO operation. These can be gang mounted, have a reinforced cable, and can be used in cold storage applications with temperatures down to -25C. The highly visible indicators display power ON and incoming light status. These units are perfect for detecting both the deceleration and stop positions of cranes and guided trolleys.